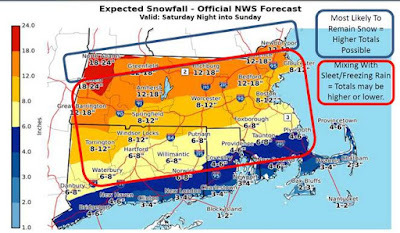 The National Weather Service is predicting our first significant winter storm of 2019. The storm will impact our region with snow, sleet, freezing rain, strong winds, minor to moderate coastal flooding, and bitter cold starting Saturday night and continuing into Sunday evening. Snow will be heavy and wet and may fall at a rate of 2 inches per hour or more for several hours. 35-50 MPH wind gusts are possible along the coast on Sunday. Minor to moderate coastal flooding is possible on east-facing shorelines around the time of the Sunday morning high tide - approximately 10 AM. Stay away from downed utility wires - they may be live. Use caution and take frequent breaks when shoveling. Clear exhaust vents to avoid carbon monoxide poisoning. Clear snow from around vehicle exhaust pipes. Dig out fire hydrants and storm drains. Be a good neighbor, check on family, friends, & neighbors.